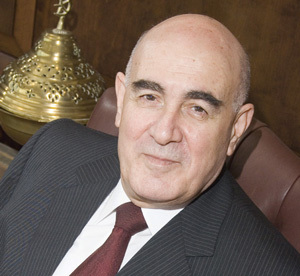 Ibrahim Dabdoub has been CEO of National Bank of Kuwait since 1983. Global Finance: What are the key risks over the next 5, 10 and 25 years? Ibrahim Dabdoub: As a banker, I would focus on financial risks, namely the deleveraging that is likely to continue for at least five years, and the tendency for regulators to over-regulate and not allow the recovery to take root. Finally, failure to implement structural reforms will inhibit growth and competitiveness, irrespective of a country's development. GF: The past quarter-century has been tumultuous. Will the next 25 years be equally so? Dabdoub: If anything, we should expect more turbulence and rapid change in the next 25 years. Too many significant changes are occurring at the same time for things to be tame and predictable: fast-changing technology, greater public scrutiny of government performance and accountability, the transition from the old, familiar Western economic model to some new format yet to be found, and the rise of new economic powers. Add to all of that the Arab Spring, which I would refer to as the Arab Decade. GF: The development of capital markets in the region has been slow. Will this change? Dabdoub: Over the past eight months, the local debt markets have awakened, with several corporate issues hitting the market and successfully closing. We expect the development of the regional equity capital markets to slowly pick up as investor confidence improves, coupled with healthier corporate balance sheets and results over time. Another positive effect can be expected with the maturity of market regulations, which are still evolving. GF: Following the 1990 invasion of Kuwait by Iraq, what was your role in safeguarding customer assets and keeping the bank running? Dabdoub: NBK's role during the 1990 invasion is a real success story that will remain part of the history of Kuwait. We were the only Kuwaiti bank that was able to continue operating throughout those dreadful times. We operated out of our branch in London and continued to serve and support our clients and, in many cases, acted as a central bank until Kuwait was liberated.